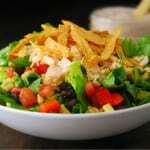 This Chicken Fajita Southwest Salad is a flavorful summer salad recipe that’s perfect for backyard barbecues and cookouts. It can be a dinner side dish or a weekday lunch. I made this Chicken Fajita Southwest Salad when we got together recently to celebrate family birthdays. 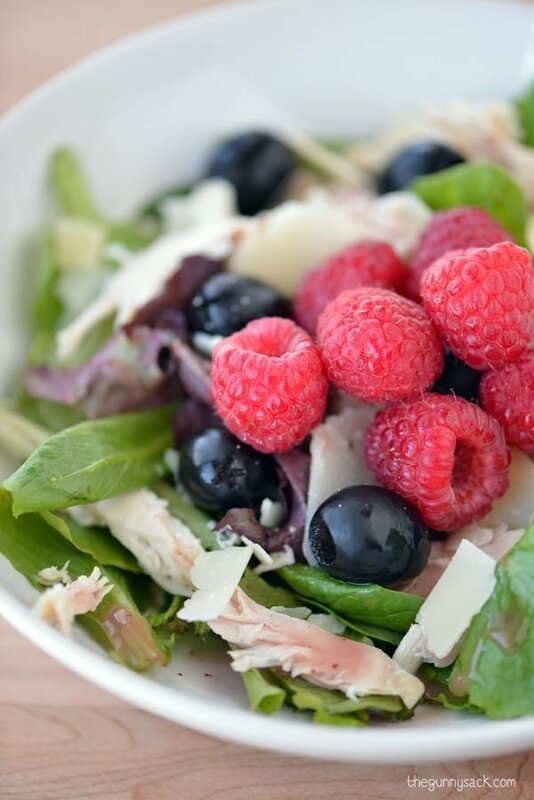 Although spring weather has not arrived yet, this summer salad recipe reminded us of what we have to look forward to. Soon we will be having chicken taco salads with hamburgers on the grill and the snowy spring will be a thing of the past! The really cool thing about this salad is that it is actually good for you. So many salads taste delicious but they are loaded with fat and calories…not this salad! 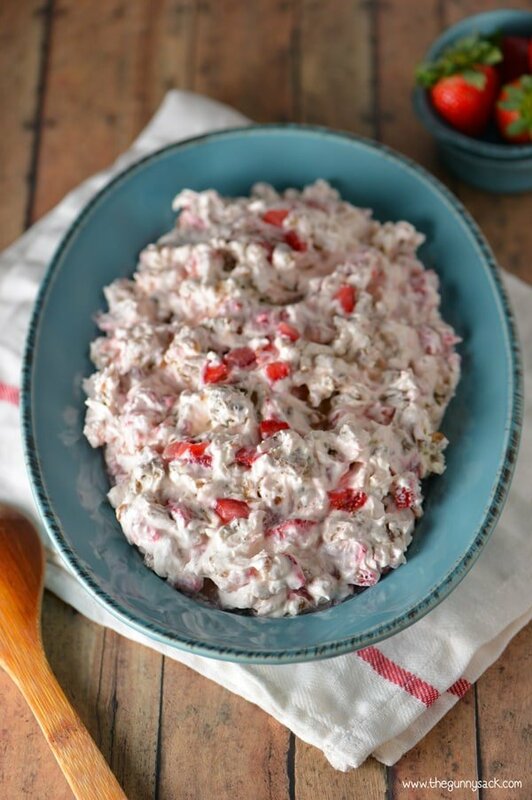 Not that I’m saying I don’t enjoy all of those salads like potato salad and seven layer salad because I certainly do, but I love having healthier summer salad recipes that I can totally enjoy without worrying about the calorie count. Like I said though, I am having a hard time picturing the summer let alone the spring. When I picked my kids up from school after lunch last week when they had a half day because of the snow, I asked them what they thought. Although they weren’t super excited about more snow, they were delighted with getting out early. Me: It just feels like winter out there! Me: And the snow had just melted. Zack: I know! It’s like there is a fight between winter and spring. Me: That is so true! So, on Monday morning (Earth Day) spring was in the lead. We could see the grass in almost the entire yard. But by the time I picked the kids up on Monday afternoon winter was up to its usual tricks once again and the snowflakes were falling fast and furious. This morning, everything is white…the grass, the trees, everything. But I checked the forecast to see if spring has a new plan in the works and sure enough, by Sunday it is supposed to be 73 degrees! We will have to wait to see who wins this week. 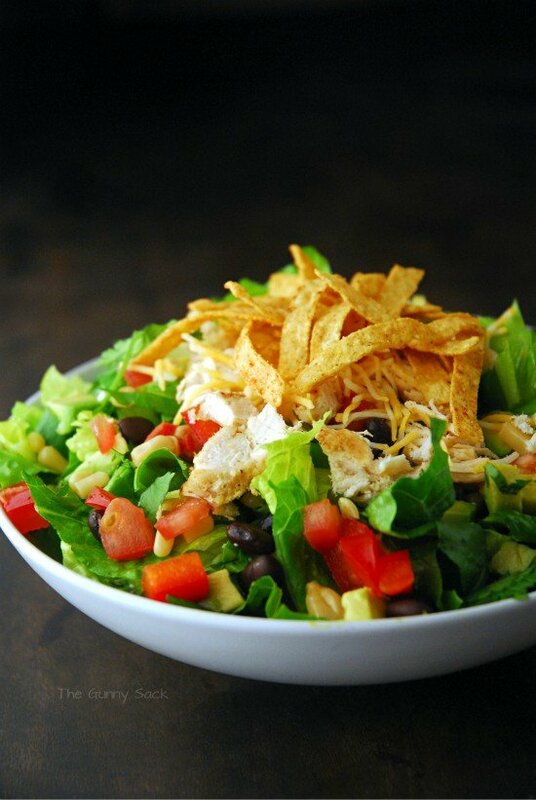 This Chicken Fajita Southwest Salad includes romaine lettuce, cilantro, green onions, avocado, tomatoes, corn, black beans, red peppers, shredded cheese, chicken and Santa Fe style tortilla strips. 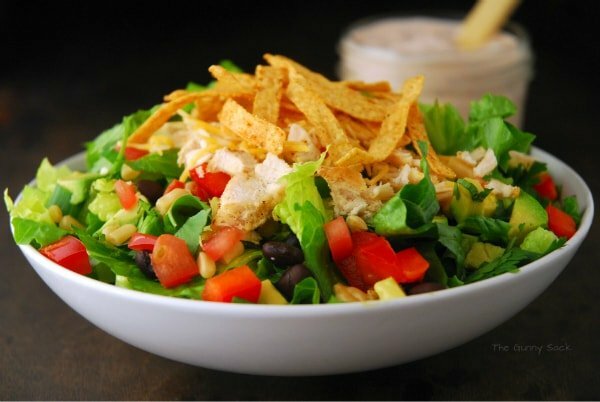 I went light on the tortilla strips but it can be more like a chicken taco salad by using more tortilla strips or even tortilla chips. 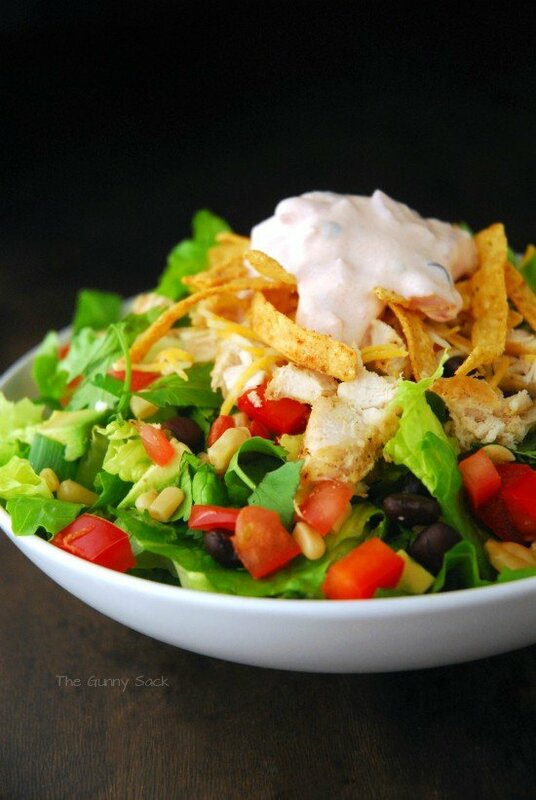 For the dressing, mix together salsa and light sour cream. 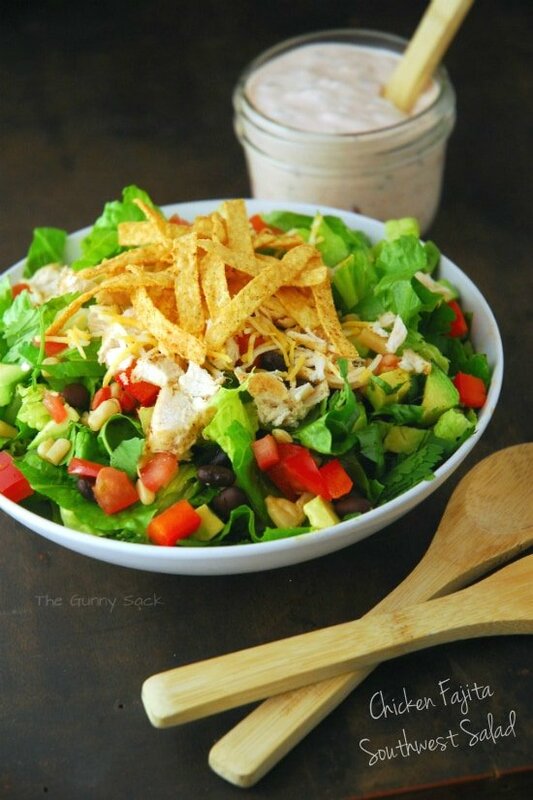 If you are wanting to lighten it up, even more, skip the light sour cream and just use salsa for the dressing. Mix together the salsa and sour cream in a small bowl. Place the rest of the ingredients in a large bowl. Top with 1/2 of the dressing and toss. We eats a lot of fajitas at my house! This salad looks incredible! Snow??? No no no, its April! I love taco salads and luckily so does my family! I adore the dressing! I am happy to report that the snow is quickly melting and they are calling for warm weather this weekend! Yay! I can’t imagine it being cold still. I’ve been running my air all week! 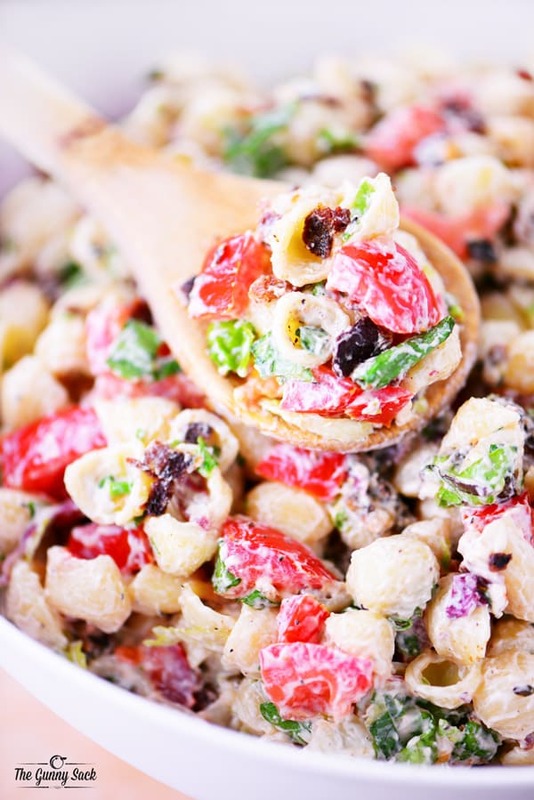 This salad is perfect for spring and summer. Anything with fajita, I’m in! this looks absolutely delicious! saving this for a good lunch recipe.